Sometimes reality can be a bad place and we create films and media to shift away from that reality. Take the film "Being John Malkovich", in it John Malkovich creates a life-sized puppet show on Broadway. It was making fun of what we as a society find as acceptable art and the only reason it was accepted was because it had a celebrity name behind it. It was also making fun of general art culture and sadly for us all that art is real. But in no way as entertaining as what happened in Being John Malkovich. 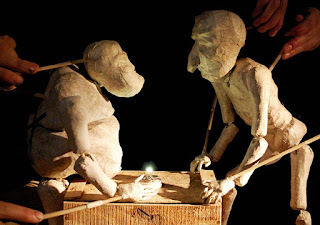 If you enjoy sad events, specifically the Chile mine collapse, why not spend and evening exploring it through marionettes made from newspapers and chopsticks in silence. Yes, there's not even a musical accompaniment. If you truly hate someone, but can't outright and say it, get them tickets for this with a good reason you can't make it.